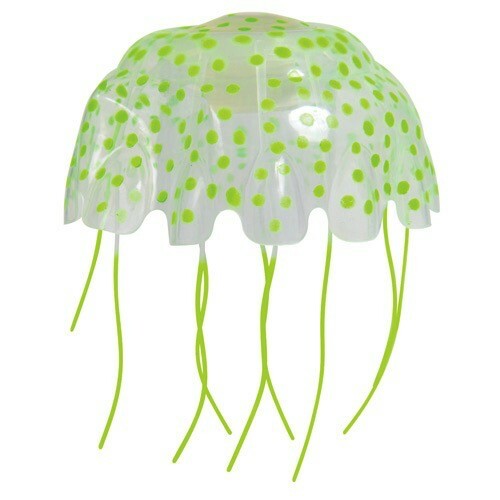 Aquaria Free-Floating Action Jellyfish - Green - Rick's Pet Stores Inc.
Free-Floating Action Jellyfish - Green Gliding through the world's oceans for over 650 million years, jellyfish are some of the most interesting and mysterious creatures. While keeping live aquarium jellyfish can prove challenging, the Free-Floating Action Jellyfish offers the next best thing. This unique and intriguing decoration is sure to captivate passersby with its brilliant coloration, realistic appearance, and life-like movement. 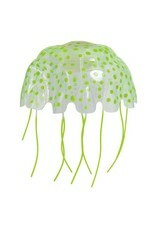 The Free-Floating Action Jellyfish is made from flexible latex allowing it to mimic the appearance and movement of the real thing. It features an integrated balancing weight that enables it to explore the water column while drifting freely throughout your aquarium. Position the Free-Floating Action Jellyfish amidst your aquarium's natural current, and watch it come to life. Use with actinic or UV light to add a stunning glow effect to this hypnotic dance!